Good afternoon. I thought I might sleep in late this morning. So I did. And it felt good! The wicked hot sizzles are back and I guess they will be here for a while. Today I will look into a program called "Shipt." It's another home grocery delivery program. I checked it before but this time I think I'll call on the phone to ask my many questions. I was going to go back to the dealership tomorrow to get my new safety sticker because I have already driven more than one hundred miles and the new computer module should be all set up. But now I think I'll wait for the temps to go down a bit. It all depends on how early in the morning I can get an appointment. While poking around on the web, I came across a picture that brings back memories from my teenage years. Back then, the guys had a line that they used quite successfully on us unsuspecting young girls. This one handsome young man asked me for a date to go see the submarine races at Wollaston Beach. Of course I said yes! Well, if you're from my time, you know how that turned out. 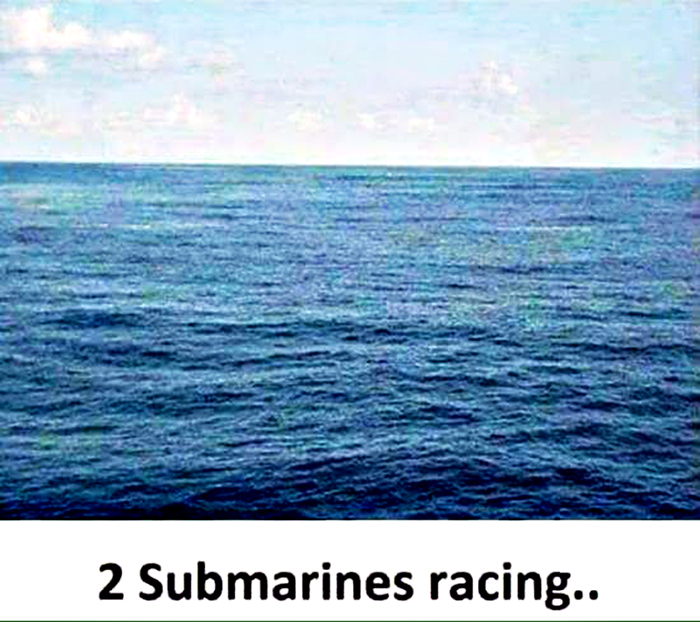 We sat there for hours, while my date kept trying to make out, and I kept trying to see where the submarines were. He finally gave up and took me home. He said he might ask me out again when I got a bit more mature. hahaha. Yup, those were the innocent days. 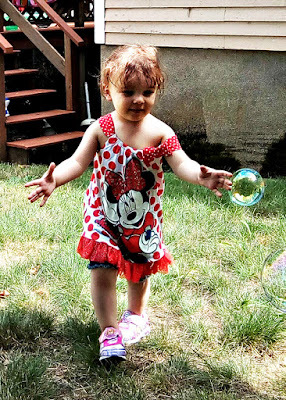 Getting back to sticky muggy weather, I have some fun photos of my great grandchildren who are enjoying the summer despite the hot temps. 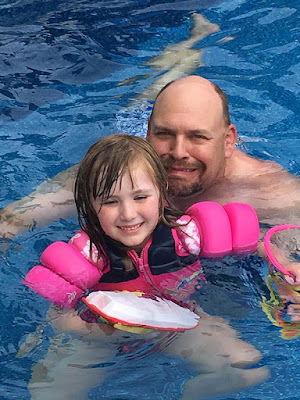 This one shows Alena (Audrey's granddaughter) with Grandpa Mac. They're cooling off in a friend's pool. Here's one of my favorite photos that Deanne sent to me. This is Aurora chasing bubbles around the backyard. The heat doesn't seem to stop these girls from having lots of fun. Today I have no special plans. I do want to call my cousin Ellen to see how she is feeling and how she is coping with these hot temps. Then maybe I'll wash a few dishes before going online to find a repairman for my dryer. The thermostat seems to be broken. Sighhhh! Of course, it just wouldn't be right if a day went by without something needing to be fixed. This past Friday night, I went with Deanne to watch Jazzy perform in a new production. I'll have more on that in tomorrow's post. Right now, I have a new quick page for you. Hopefully, this one will help to cool you off a bit. Have fun with it. Now I'm off to get a cold bottle of water and to do a bit of blog reading. So, till tomorrow, Y'all stay cool and have a wonderful day. 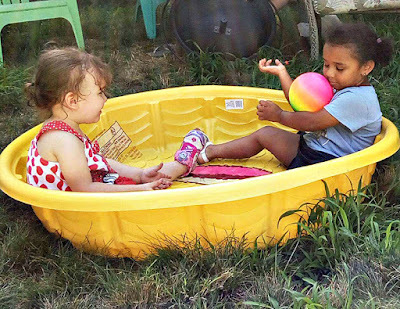 Love seeing those little ones having fun! Isn't it grand that we can see those little ones via pics when we can't be together! LOVE that picture of you! There is constantly something in need of repair here! Hope the fix is easy and not expensive! Have a blessed day dear friend, HUGS! Hi, I just love the pictures of the girls. Is the dress Aurora wearing one that you got for her when we were in Florida? It's gorgeous on her and I just can't get over how fast they are growing. 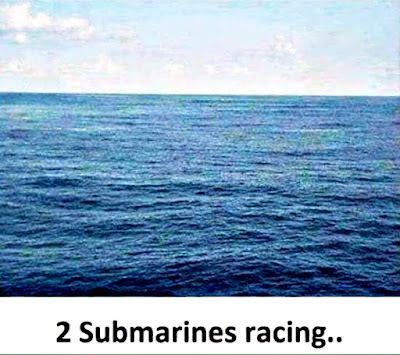 I had to have a laugh at the Submarine Races. It reminds me of "Snipe Hunting" lol. At least your date took you home. My girlfriend Minna wasn't that fortunate. Her date left her in the woods. Jerk! I am glad that you liked the pictures. It was fun to play. I need to check and see what they have today. It is an app for your phone. If you go to your Google play store type in Photo Lab, you can download it. I used the free version for a long time and then I decided to buy Photo Lab Pro about a year ago. 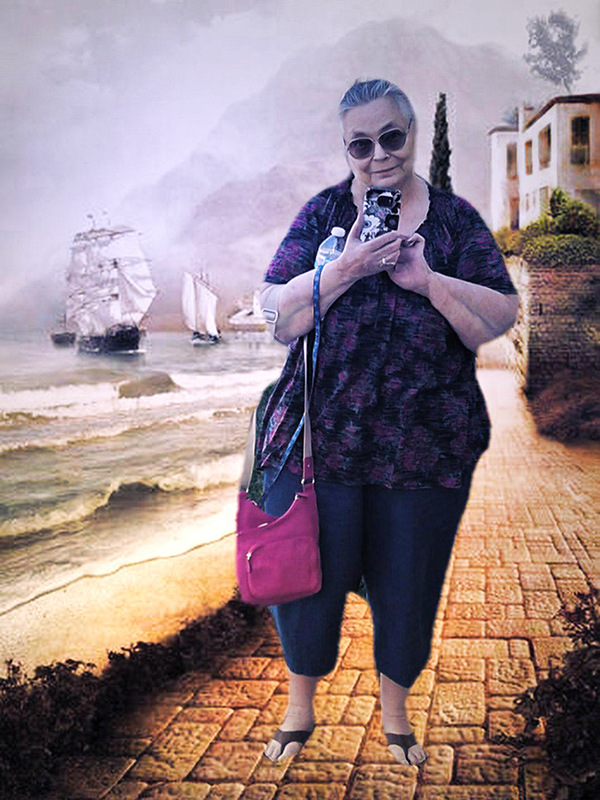 It is really a lot of fun and you don't get the hash tag with the pro version plus there are a lot more of styles to play with. I make the photo and then email it to myself. Pretty cool.